The author has kindly shared with readers of the Victorian Web this essay, which is an expanded version a lecture delivered to the Trollope Society in London on November 23, 1999; the whole essay has been published in the February 2000 Trollopiana and on her rich Trollope site. Where possible, bibliographical information appears in the form of in-text citations, which refer to items in the bibliography at the end of the document. Superscript numbers (do not form a complete sequence) link only to documents containing substantial bibliographical information. Clicking upon the number for the note takes you to the left column; clicking on the back button returns you to your place in the main text. Titles of Trollope's novels link to Trollope Society plot descrioptions or to documents leading to multiple discussions of the book in question. indicates a link to material not in the original version. [GPL]. 1. On 'free indirect speech' and 'narrated consciousness', see Dorrit Cohn, 'Narrated Monologue: Definition of a Fictional Style', Comparative Literature, 18 (1966), pp. 97-112; Norman Page, 'Frequent Conversations' in The Language of Jane Austen (New York: Barnes and Noble, 1972), pp. 114-67; Roy Pascal, The Dual Voice: Free Indirect Speech and its functioning in the nineteenth-century European novel (Towota, New Jersey: Rowman and Littlefield, 1977), 1-32, 67-97; Bill Overton, 'The Interior View' in The Unofficial Trollope (New York: Barnes and Noble, 1982), pp. 105-22. 3. For my understanding of epistolary fiction I owe a great deal to A. D. McKillop, 'Epistolary Technique in Richardson's Novels', Rice Institute Pamphlet, 37 (1951), 36-54; Robert Adams Day, Told in Letters (Ann Arbor: University of Michigan Press, 1966); François Jost, 'Le Roman épistolaire au XVIIIe siècle', Comparative Literature Studies , 3 (1966), 397-426; and Janet Gurkin Altman, Epistolarity: Approaches to a Form (Columbus: Ohio State University Press, 1982). 4. See 'Clarissa' in Writings for St Paul's Magazine: Anthony Trollope , compiled and introduced by John Sutherland (New York: Arno Press, 1961), pp. 163-72; also Trollope's letter to Dallas, N. John Hall's The Letters of Anthony Trollope, 2 vols. (Stanford: Stanford University Press, 1983), i, p. 444-45. 5. In Kathleen's Ward's 'Dear Sir or Madam: The Epistolary Novel in Britain in the Nineteenth-Century' (Ph.D. Dissertation, University of Wisconsin-Madison, 1989), p. 13, Ward expresses surprise at how rarely after Richardson novelists availed themselves of the real obstacles a letter has to pass through before it reaches a recipient. She suggests that in all nineteenth-century novels 'letters arrive with breathtaking promptness, even if they are supposed to be coming to England from Italy or from Amrican during the War of 1812'. She has forgotten Trollope. 8. See also at the novel's close Arthur Wilkinson's exchange with Adela Gauntlet (The Bertrams 42, 43). It is worth noting that this couple marry on the same day of the year as Anthony and Rose Trollope, June 11th, and the narrator urges us to 'trust that the day may always be regarded as propitious'; Trollope's new reliance on the self-revelatory type of letter in this novel may be connected to the strongly autobiographical material in this novel; see Lawrence Jay Dessner, 'The Autobiographical Matrix of Trollope's The Bertrams', Nineteenth-Century Fiction , 45 (1989), pp. 25-38. 9. While one can find many fleeting brief uses of a subjective response to a letter in fictions where intensity is required, e.g, Wilkie Collins's The Moonstone (1868) or Margaret Oliphant's ghost story, 'The Open Door' (1882), there are only a few nineteeth-century novels in English where this interwoven subjectivity becomes the basic narrative method for long stretches of the narrative. Even here either the sequence is kept relatively short or it's not central to the method of the fiction as a whole: the Portsmouth episode in Jane Austen's Mansfield Park (1814); the opening third of Sir Walter Scott's Redgauntlet (1824); scattered places in the interspersed diary-journal and letters in the long middle section of Anne Brontë;'s The Tenant of Wildfell Hall (1848); in a couple of chapters of George Meredith's Evan Harrington (1861); and throughout the third story of Elizabeth Gaskell's Cranford, 'Memory at Cranford, or Old Letters' (1852). Day points out instances of this sort of mixed narration in fiction before the mid- eighteenth century, but it is usually crudely done and without the use of free indirect speech. 11. I cannot be certain my numbers are faultlessly accurate. Since from Dr Thorne on, Trollope doesn't necessarily leave a space on the page, open the letter with a salutation, and close it with a signature, but intertwines many of them, by the middle of his career several at a time, it is possible to miss letters. I attempted to count described, cited, and summarised letters, letters which were destroyed, not sent, and thought about, cards and telegrams which were quoted and figure centrally in the action, as well as correspondences which were numerical; for the sake of comparative clarity, I also counted determinate and indeterminate series of correspondences as one semi- epistolary narrative each as they are similar in effect ot a single iserted or interwoven letter. I think I caught most of them; where I didn't, I believe my numbers still reflect the relative proportions of pages to numbers of letters in any given novel. One cannot count letters in Trollope's novels by using a computer since sometimes he uses neither the word letter nor note; in any case, there are e-texts for very few of them. 12. See, for example, 'The Courtship of Susan Bell' (July 1859), 'The House of Heine Brothers in Munich' (April 1861), 'The Mistletoe Bough' (August 1861), 'Miss Ophelia Gledd' (March 1862), 'The Telegraph Girl' (1877), 'Alice Dugdale' (May-June 1878). Trollope's Editor's Tales, 'The Adventures of Fred Pickering (?March 1864-spring 1867), with thirteen, and 'The Lady of Launay' (March 1878), with eleven letters, are rare exceptions. 14. The resemblance of interlocutory letters and stage dialogue is discussed by just about everyone who has ever written about epistolary narrative or specific epistolary books. The novel which makes the most riveting use of antiphony is Les Liaison Dangereuses by Choderlos de Laclos (1782); for contrasted voices in opposition used centrally in Trollope, see The Belton Estate (1865) at key turning points in the action (2, 16-18, 21, 32). 15. The Eustace Diamonds (1869-70), contains fifty-eight letters, three of which are our heroine's drafts of one letter, and another which is written, not sent, and then destroyed after the writer reads someone else's letter upon the same subject. Correspondences not discussed below include include: Lizzie and Frank Greystock; Lizzie and her other relatives; Lizzie and Frank Greystock, Lizzie and Lord Fawn; Lizzie and her friend, Mrs Carbuncle; Lizzie and Joseph Emilius, Lizzie and Lucy; Mrs Hittaway (Lady Fawn's daughter) and the Fawns; Mrs Carbuncle and the guests invited to her ward, Lucinda Roanoke's wedding; Mr Camperdown and Frank and various other lawyers; and a series of interchanges between Lady Glen and the Palliser characters commenting on what is happening inthe other plots of the book. 17. Possibly the most famous epistolary novel in which nothing outward happens is Johann Goethe's The Sorrows of Young Werther (1774). Trollope probably read a nineteenth-century version of the type in Edward Bulwer-Lytton's Falkland (1827). Characters who are paralysed by a dilemma which occasions their story are common in Trollope's later novels, but the sort of triangular story in which hero and heroines are kept apart and conflicts arise between the need for money and the desire for love that is closest in its use of epistolary technique to what we find in Lucy Morris and Frank Greystock's story in The Eustace Diamonds is the story of Harry Clavering's vacillation between Florence Burton and Julia, Lady Brabazon in The Claverings; the large number of and reliance upon letters in that novel is justified by its inward focus. A similar situation arises between Lily Dale and Adolphus Crosbie in The Small House, but it is resolved by Crosbie's ignoble letter interwoven half-way through the book (31). 19. I do not include Trollope's last novel, The Landleaguers in this spread since its depiction of nightmare paranoia and murderous treachery is best understood in terms of what we find in Trollope's other Irish novels, The Macdermots, The Kellys and O'Kellys, Castle Richmond, An Eye for an Eye, and two Irish stories, 'The O'Conors of Castle Conor, County Mayo' (?September-October 1859) and 'Father Giles of Ballymoy' (?just before May 1860). 24. Gotobed's letters repeat a type in Phineas Finn (1866-67). Another elected representative of a group of people, Joshua Monk, Liberal Member of Parliament, in his role as mentor, writes for his protégé, Phineas, an analysis of the English political system (35) whose gradualist approach to reform also closely resembles Trollope's own (An Autobiography (16-17, 20). Monk is, however, a realistic character who lives among sophisticates who solve problems through compromise; the context allows Trollope to use this figure to focus on principles and depict a exemplary picture of the kind of representative government which will produce useful laws. 25. David Stryker, 'The Significance of Trollope's American Senator', Nineteenth-Century Fiction, 5(1950), pp. 141-49; Ruth apRoberts, 'Trollope's One World', South Atlantic Quarterly, 68 (1969), pp. 463-77; John F. Hynes, 'The American Senator: Anthony Trollope's Critical 'Chronicle of a Winter at Dillsborough', English Studies, 69 (1988), pp. 48-54.
ood Evening, ladies and gentlemen. I have come here tonight to describe to you a strange element in the nature of Anthony Trollope's story-telling art. His novels are stuffed with imaginary letters. Chock full. So many that our story-teller cannot include them all: no, he summarises, paraphrases, and quotes epitomising snatches. Some he throws into free indirect speech in which he combines his characters' thoughts with his own.1 When it is to his purpose, though, he fills whole chapters with letters, and labels them with titles like 'The Stanbury Correspondence'. When it is important that we keep the order the letters were received, read, and answered clear, he numbers them for us. He will encapsulate in a single letter or a summary of lengthy correspondence episodes lasting several months or a few years. One lone letter can initiate a crisis in a novel; another, a novel's central story. Not that there are too many letters for Trollope's characters. While they often dislike letters written or received by characters whose behaviour they want to control, Trollope's characters like writing and receiving letters themselves. If they are thoughtful types, they plan the letters they write. They think about what response they want from the letter's recipient. They consider, cross out and revise carefully. Characters have been known to go through five full drafts and secret these away until such time as it is appropriate to use one. When Trollope's characters receive letters, they may dread unfolding them; nonetheless, once they're unfolded, they proceed eagerly to read and interpret them. They may meditate and feel moved by letters. Many characters grow indignant and argue with other characters over a letter. Merciless and amoral characters destroy, or tempt other characters to destroy the letters which belong to yet another character. Some characters hesitate before some dimly-glimpsed possible ill consequence of writing answers on their own. They get a trusted accomplice to write their letters for them. Other characters are bullied into taking dictation. His nervous guilty characters hide notes. There are characters who write letters and then don't send them; still others leap helter-skelter into the fray. First, throughout his novels Trollope plays upon the difference between the thoughts and speech of his characters and their written words: a letter is easily, nay readily, misinterpreted; its documentary nature allows it to be used as a weapon. In Trollope's novels letters are often public performances. Some of Trollope's characters write obliquely to convey what they daren't say explicitly and hope their friend will understand; some letters are calculated to elicit a particular response, though the writer may not get it. Other characters write poorly controlled letters. The writers expose aspects of themselves, which, were they able to, they would have kept hidden. Beyond exploiting the relationship between a letter-writing character, a letter, and its imagined recipient, Trollope takes advantage of the fact that the events retold in a letter can be organised independently of calendar time. Letters allow him to ignore the temporal sequence of his novel's events to follow his characters' or story-teller's trains of memory and imagination. Letters link disparate stories drawing ironic parallels between the characters in these stories. Trollope's story-teller is fond of making us read a pair of letters over a character's shoulder in reverse order. This makes the character reading the letter seem realer to us. His narrator makes plain to us both what the character who is reading the letter infers from said letter and what, by contrast, his narrator would like us to notice or infer. Trollope is aware that the sudden inclusion of letters, in whatever order, deforms an otherwise omniscient narrative and imports into it meanings he cannot control. If we believe — and I assume all of you here do believe — that Trollope is one of the greatest nineteenth-century novelists, it seems incumbent upon us to ask what he does better than most of his contemporaries, what he does that they don't do? One thing he does is use letters as a narrative medium on their own and woven into a nuanced omniscient narrative, and he makes these letters and partly epistolary narratives central to his stories. This combined texture allows us to observe terrains in his characters' minds which actuate real people's behaviour in life. The outward behaviour a written letter provokes provides Trollope with a graphic and striking means of dramatising the real constraints of our lives. The story of Trollope's uses of letters in his fiction is not one of painstaking gradual artistic development, but of sudden changes and shifts in emphasis. Throughout his career, Trollope decides how many letters to have and how long his epistolary episodes will be to suit a book's proposed length. He takes into consideration the occupations of its characters, their level of education and cultural milieu. I have been able to discern three phases of change, though these phases overlap. The first phase of Trollope's use of letters runs from The Macdermots of Ballycloran (1843-45) through to The Bertrams (1858). (The years cited after a mention of each novel or short stor when the occasion seems to warrant it record when Trollope wrote each fiction; in those few cases, mostly short stories, where we only have a publication date I give an approximate date of composition. The numbers in parentheses which appear after quotations from the novels and An Autobiography indicate the chapter in the novel in which the passage may be found; for the sake of the comparative clarity to be gained through consistency, I have used consecutive numbers throughout.) The most important developments in Trollope's epistolary technique occur towards the end of these fifteen years. In his first five novels, The Macdermots, The Kellys and O'Kellys, La Vendée, The Warden and Barchester Towers, when Trollope writes an imaginary letter or note, he drops it in. His narrator stops moving forward chronologically. Reasons for the existence of the letter are adduced. It is inserted. The narrator guides our responses to it by interpreting it for us explicitly just before, during or after the letter closes. Omniscient narration resumes. When it is a letter which we must know about but which will not be included, we are given in lieu of it a brief description, a quotation or two which conveys its gist, or a very brief paraphrase dominated by a style and tone associated with the stance of our story-teller in the particular book. In Trollope's first five novels, letters are typically acts of friendship. They serve to unite the absent writer with the recipient on the basis of common shared values, of some service done, or of reciprocating thoughts in the form of information the writer knows his recipient will be interested to hear, help offered, advice, kind words or expressions of love.In nineteenth-century novels, letters in either omnscient and fully epistolary novels are most often 'efforts to communicate ... to maintain an emotional or, sometimes, an intellectual relationship despite a physical separation'; see Ward, pp. 187-297. Examples: Mr Harding to Bishop Grantly in which he tells the Bishop those feelings he has which he hopes will make the Bishop sympathise with his decision to give up the Wardenship and reassure him that he and his daughter, Eleanor, will still have his income as precentor to rely upon (The Warden 19). In The Kellys and O'Kellys three letters by Walter ('Dot') Blake, sportsman, gambler, and expert horseman, to his patron, Francis O'Kelly, Lord Ballindine. In these Blake tells Ballindine how wonderfully well their shared horse is performing and how much money they are making; Dot also urges Ballindine to woo the book's rich heiress, Fanny Wyndham (Kellys 26, 34, 39). This use of letters recurs throughout Trollope's writing career. In The Prime Minister (1874), a series of long letters between the Whartons of Wharton Hall, Herefordshire, and Emily Wharton Lopez in London are the basis of the chapter, 'The Great Wharton Alliance' (75). In Trollope's last novel, The Landleaguers, letters to the Anglo-Irish Jones family urge them to go out in public 'to show the country that, though you are boycotted, you are not smashed' and 'not afraid to come out of house although certain persons have made themselves terrible'. Military protection is promised (24). It is of course the case: Feemy is unmarried, pregnant, and her pregnancy is beginning to show. She flees Mrs McKeon to conceal her pregnancy and be alone. Trollope's first imaginary letter shows him using Irish-English rhythms to convey Feemy's nervous anxiety to make Mrs McKeon respond to the letter as Feemy desires. In his earliest novels Trollope also uses letters to dramatise intangible truths about interactions between people he can't get at any other way. In his second novel, The Kellys and O'Kellys we read the first of the many letters in Trollope's novels where one character ghost-writes a letter for another. Barry Lynch pays his attorney, Mr J. Daly, to write a letter to Barry's sister, Anty Lynch, which will frighten her into returning to Barry's house. Daly has the ability to use intimidating legal-sounding words which imply that if Anty does not return, Barry can institute and win a lawsuit which would cost Anty her inheritance and cause much, probably expensive trouble for her staunch friends, the Kellys, to whom she has fled to escape Barry's violence (17). In her letter in response Anty just manages to refuse: 'I (am very sorry I) can't come back to the house, at any rate just at present. I am not very sthrong in health' (18). Daly has now to contend with Michael and the Widow Kelly to get access to Anty. He fails to intimidate them into yielding her up, is roundly insulted by them, and then returns to Barry, where he is confronted with sneers at his dishonesty. This game with the power and limitations of letters in a human context reaches its climax in Daly's moment of salutary self-disgust, 'To tell you the truth, I'd jist as lieve you'd take your business to some one else' (20). In these first five novels, the letters which are most vibrantly alive are those which are egregiously hypocritical, but intimidate only the very sensitive or vulnerable. I expect most people sitting here remember Mr Tom Towers' articles in the Jupiter which caused Mr Harding so much distress (The Warden7, 9-10). In Barchester Towers, Trollope spins several episodes out of the different responses different readers have to the same letter. Mr Slope's 'long and tender' epistle by which he meant to woo Eleanor Harding Bold, now a wealthy widow, by offering her father the Wardenship of Hiram's Hospital enables Trollope to explore how very few people care about understanding what they read, except as it impinges on the practical realities or emotional beliefs of their lives. In this early heated and anxious debate by a group of characters who think they look on life similarly, we see that nonetheless they react very differently to the same letter: congenial characters are dismayed; distrustful characters form a community of spies. Eleanor's sister insists the letter must have something in it Eleanor is ashamed of. Else why not show it to her? Dr Grantly does not know how further to reproach Eleanor when she lets him read the letter since he cannot understand her complacency towards it: she thinks Mr Slope's offer of a place and income to her father is what is important in it; he thinks Slope's unctuous tones and salacious words are what count (28-30). From The Warden on, Trollope's characters' meditations over letters often consist of (I'm afraid, mistaken) speculations about how the letter will be read by other characters. From Barchester Towers on, Trollope wrote fictional variants on triangulations of motive, goal and assumption, misreading and emotional overreaction. An example: over one-third of Miss Mackenzie (1864), is derived from variously hypocritical, bullying and quasi-spiteful love and business letters. The plain, thirty-four year old and hitherto lonely and isolated Miss Margaret Mackenzie has inherited from her unmarried brother a fortune which provides her with a yearly income of £800. Through four long letters a group of crassly self-interested suitors woo, pressure and lie to her. She writes two letters which fend off two of these men; in a third, she hides from her lawyer the reality that, driven by his needs and ambition, her married brother has mismanaged her money (1, 10, 15, 19, 23, 27). These seven letters are embedded in scenes of misreading and overreaction. Late in the novel, just in the manner of Mr Harding, Margaret and her most honest suitor, John Ball, suffer exquisite mortification and distress when one of the rejected suitors, the Rev. Jeremiah Maguire, manages to expose his version of the sordid dealings that have gone on in a series of letters to the Christian Examiner. The narrator explains to us why such material gets published: 'the very strong and one sided religious convictions' of the editors and readers of such newspapers enable them to justify to themselves such 'personal, heavy, biting and scorching attacks' (24). It was during the writing of his sixth through eighth novels, The Three Clerks, Dr Thorne and The Bertrams (1857-58) that Trollope developed important uses of letters and techniques for presenting them in compressed form that remains central to his story-telling for the rest of his career. In a few places in The Three Clerks (12, 14, 47) and Dr Thorne (18, 42), and then continually in The Bertrams letters record a character's inmost mixed and vacillating feelings. These letters trace painful emotional and moral conflicts. Letters in Trollope's fictions now may be sincere outpourings of a character's inner life written to the moment under the pressure of some immediate distress, to someone whom they hope will respond with deep sympathy and equal candour. Such letters are performative: by writing them the characters reveal their personality or make a decision whose consequences they cannot foresee. In response, Adela tells Caroline that she has misunderstood both George's and Harcourt's motives. George is deeply in love with Caroline, and Harcourt has been manipulating their conflicts. Caroline has acted wrongly — and unwisely. Adela excuses herself for not sympathising with Caroline's point of view by labelling her reply 'savage'; however, her tender tones bely her self-accusation: 'I fear I have written savagely. Dear, dear Caroline, come to me here, and I will not talk savagely. I too am not happy'. People respond more to the tone of a letter than its content: Caroline is not hurt. These two letters are part of a number of epistolary debates in this novel. By the end of the book Caroline's emotional and sexual coldness towards Harcourt and his lack of real affection for her drives them apart. He is badly in debt, and after he loses office, fearing bankruptcy and exposure, he kills himself. Still Adela cannot be said simply to win the debate. George drove Caroline from him in his earlier letter when he refused even to take into account his complete lack of a secure income (17) and by his wild behaviour in response to her vacillation over and betrayal of his letter to Harcourt. The other important change that happens around the time of The Three Clerks, Dr Thorne and The Bertrams is Trollope presents letters as highly compressed redactions, abbreviated versions of letters, within an on-going omniscient narrative. Trollope uses and gradually learns to exploit with great subtlety a mixed form of narrative which had appeared in fiction only intermittently before, and hardly ever in English novels during the nineteeth century. He weaves close paraphrases of imagined letters into webs of words which include his story-teller's free indirect speech paraphrases of the writers' thoughts as the letter was written. He includes the imagined reader's thoughts. If the recipient of a letter is reading it in company, Trollope's story-teller will describe the scene and company's reaction. These mixed mode paragraphs which replace letters include scintillating distinctive bits of the withheld letter. From now until the end of Trollope's career telling a story through letters no longer requires that the narrator stop the story, insert a full letter, and resume again. Letters and reading events blend with Trollope's story-teller's continuous monologue or consciousness which also carries the dramatic narratives, third-person omniscient meditations, and the briefly related events of the book. The gain in nuanced control, concision, reading-time and variety of perspectives is enormous. The first occurrence of this enriched form of semi-epistolary narrative in Trollope occurs early in The Three Clerks. As he had done in Barchester Towers, Trollope's narrator first inserts a whole letter by Harry Norman. Harry tells a friend and older woman, Mrs Woodward, that his cousin and rival, Alaric Tudor has obtained promotion in the Civil Service because Alaric has done well on an exam which he, Harry, could not get himself to take. The reply, though, is an interwoven redaction. Mrs Woodward's kind and sympathetic letter to Norman, appears in abbreviated, paraphrased and quoted bits, as also her cool letter of congratulation to Alaric, and a letter of exultation on Alaric's behalf by a naval veteran, Captain Cuttwater. These three alternate with the narrator's nuanced presentation of Harry's spasmodic depression as he reads Mrs Woodward's letter to him. The narrator interjects into this stream of epistolary and reactive words praise for Mrs Woodward's efforts to keep the surface of social life between everyone mostly peaceful. The narrator also reveals that her daughter, Gertrude, whom Harry loves, feels distaste for him and will marry Alaric (12). Later in The Three Clerks Trollope presents in this interwoven partly epistolary way one of Gertrude's many letters written from Australia to her whole family in England. She has gone to live in exile with Alaric after his conviction for embezzlement. Over a four-page span Trollope fits extracts, paraphrases, and descriptions of Gertrude's letter into a long scene where Mrs Woodward, her youngest daughter, Katie, and Alaric's other cousin, Charley Tudor take turns reading and commenting on it. Woven into this stream we find the narrator's comments: he urges us to sympathise with and forgive Alaric, and reminds us of the 'poverty, scorn, bad repute, and the privations of a hard life' Gertrude and Alaric are enduring. His interjections form a counterpoint to the piety, anger and conventional moralising of the characters reading Gertrude's letter. Her letter does not mention the amoral Undy Scott, a stockjobber who tempted Alaric into his crime, but the narrator can still say: 'We would have hanged Undy had the law permitted us' (48). 'Our happiness will never be perfect unless you will consent to share it'. Thus simply, in the affection of her heart, had Gertrude concluded the letter by which she intended to pour balm into the wounds of her rejected lover, and pave the way for the smoothing of such difficulties as might still lie in the way of her love. In and after The Three Clerks acts of reading and also of writing letters become complex narrative events. The chapter, 'De Courcy Precepts and De Courcy Practice' in Dr Thorne, Trollope's first almost wholly epistolary chapter includes a long grating letter which the ruthless Lady Amelia de Courcy writes to intimidate her gullible cousin, Miss Augusta Gresham, into rejecting an offer of marriage by Mr Mortimer Gazebee on the grounds that if Gazebee becomes Augusta's husband, Augusta will fall to a lower position in society. The narrator presents Augusta's mind as she planned, wrote the letter to which Lady Amelia responded, and then reacts to Lady Amelia's letter with a letter of her own in dismay. Augusta cannot survive with her ego intact if the Lady Amelia pronounces what she has done degrading (38). When such episodes are written in Trollope's compressed interwoven way, we witness each little turn of Trollope's imagined reader's minds whether they subtly misinterpret or respond accurately to their letters through the prism of their self-defenses and desires. In The Small House at Allington, written five years after Dr Thorne, the correspondence of Lily Dale and Adolphus Crosbie appears as part of a seamless narrative interwoven with Trollope's narrator's consciousness. The effect of such concision mixing these two voices with the narrator's helps account for the singularly intense impression of poignancy with which we come away remembering Lily's love for this man. Crosbie's final letter breaking the engagement is presented mixed with Lily's and Mrs Dale's responses. Such semi-epistolary narratives are basic to Trollope's way of telling a story by this point: he moves back and forth among the conflicting divagating responses of Lily, her mother, Adolphus, and his narrator, all of which are subjective (21, 25, 27, 31). Such richness of emotion, perception, ethical inference and sheer content is not limited to love letters in Trollope's fiction: four years after The Small House, in The Last Chronicle of Barsetshire, the letters between Dr Tempest, Bishop Proudie, and the Rev. Josiah Crawley are interwoven into the novel's texture as semi-epistolary episodes at turning points of Crawley's ordeal. The power of these dignified and courteous letters comes from the way they are compressed and presented as paraphrases and bits of text closely interacting with one another and the mind of the narrator who conveys the proud, hesitant, reluctant and disquieted minds which pen them (47, 54, 61-62). Trollope is not the first novelist to dramatise the inward acts of writing, reading and interpretation. Jane Austen dramatises her heroines reading, responding to and having difficulty writing letters. However, in Austen's novels her imagined readers do not misinterpret their letters; the imagined letters are not themselves chopped up into bits and paraphrased, and threaded tightly into the shared narrated consciousness of imagined readers and a continually active story-teller. Trollope keeps no distance between letter-writer, letter-reader and narrator. When he enacts minds responding directly to nuances of a letter, he allows us to confront immediate responses and thoughts which are not put on paper but lead to what is put there. There is a thematic pattern which recurs in these semi-epistolary narratives when they form the crises of the later books. In Dr Thorne Augusta is a character whose self-respect is based on a group of social values to which she passionately adheres. These blind but also shield Augusta from foreseeing that Lady Amelia objects to her marriage to Mr Gazebee because Lady Amelia is unmarried, thirty-four and has a heart 'as hard as flint'(38). In Trollope's later fictions characters become distraught and agonised over their responses to and misinterpretations of other characters' letters when their self-definition or values are at stake. In Nina Balatka, written just before The Last Chronicle of Barsetshire, Anton Trendellson becomes almost uncontrollably distressed and enraged and acts savagely towards Nina when letters seem to demonstrate that Nina has cheated him; Anton has made Nina the repository of his most cherished hopes for himself in life (8-9). In Trollope's most powerful mid-career books he uses the act of composing and reading letters and of course letters themselves to depict characters who think and behave in ways that are dangerously self-destructive when their self-image or self-respect is threatened: we may class among such figures the Rev. Joshua Crawley in The Last Chronicle, Robert Kennedy in Phineas Redux (1870-71), and Josephine Murray, the Countess of Lovel in Lady Anna (1871). In one of Trollope's greatest novels, He Knew He Was Right (1867-68), Trollope places many letters which are authentic records of a writer's spirit before the eyes of readers whose nature, upbringing or circumstances differ radically in some way from those of the writer but whose assumptions the writer shares. The result is a novel in which many characters seem more than a little insane. They are, in the narrator's phrase, 'not sane enough themselves' to stop the cycle of disturbing letters (45). The story of Louis Trevelyan's descent into madness begins with vitriolic interchanges between him and his wife, Emily, over ambiguous letters between Emily and a rakish elderly male who visits her, Colonel Osborne. Louis and Emily carry on their quarrel through letters in which they harrow one another. A third series of letters ensues when Louis hires an ex-policeman, Bozzle, to find evidence of Emily's adultery: as we read Bozzle's broadly parodic letters through Louis's eyes we witness Louis's obtuse sexual anxiety become a form of hysteria (5-6, 10, 19-21, 26-29). The cruel nervous humour of this third sequence of letters distinguishes it from similar self-parodic letters in Trollope's earlier books. The effect of these earlier letters, for example, those by 'Screwy' (Verax Corkscrew, a clerk in the Internal Navigation Office) or Abraham Mollett (a blackmailer's doubledealing son) is poignant ironic comedy. Since these earlier letters are transparently hypocritical, written by weak people, and read by calm strong characters (The Three Clerks 18; Castle Richmond 39). In contrast, Bozzle is simply candid and speaking accurate truths about the hidden nature of sexual experience which is what torments Louis. Bozzle knows — as do we all — 'There is things, Mr Trewillian, one can't see' (19, 23). Bozzle's zeal does not provoke hilarity so much as unease because we read it through Louis's increasingly paralysed despair as he finds that he sees himself and Emily in the way that Bozzle sees them (45). Hugh Stanbury, Trevelyan's friend, tells Louis he should destroy such letters unread. Louis cannot. Since it would justify Louis's behaviour, Louis longs for the information that will destroy him (38). The second phase of Trollope's epistolarity runs from the year and one-half in which Trollope produced two novels at once, Castle Richmond and Framley Parsonage(1859-60) and began his first blockbuster masterpiece, Orley Farm (1860-61). It ends with Lady Anna, written twelve years later. In Castle Richmond and Orley Farm Trollope initiates, picks ups threads of his stories, sustains, drops and resumes them again by presenting what happened since we last left off through dialogues between inserted and interwoven letters (e.g, Castle Richmond 5, 15, 37; Orley Farm 4, 11, 21). In and after Framley Parsonage Trollope knits his stories together through correspondences between characters (Framley Parsonage 4-5, 21, 32). From The Three Clerks on, without their letters, Trollope's novels would be disconnected fragments; however, by the time of The Vicar of Bullhampton and Sir Harry Hotspur (both written in 1868), characters who live apart write one another at regular intervals and always at meaningful turning points in their lives (of which they seem to have very many). In the middle phase of Trollope's epistolarity, it is almost true to say, a reader can get the gist of all that has happened of importance in a Trollope novel just by reading its letters and semi-epistolary narratives in a row, and skipping over everything else. You can, for example, read the love story of Mary Lowther, Walter Marrable and Harry Gilmore in The Vicar of Bullhampton by reading the letters in Chapters 14, 18, 21-22, 33-34, 37, 39-40, 54, 59, 64-65. See also Pearson, p. 397, and the epistolary interlace of An Eye for an Eye (1870), Chapters 1-2, 9-11, 13-15, 17-19. I have some numbers: The Bertrams is the first novel to show the exponential growth in the number of letters per novel which resulted when Trollope began to weave bits of letters and paraphrases from them into his earlier plain omniscient narratives. There are four letters in The Macdermots, ten in The Kellys and O'Kellys, one in La Vendée, and six in The Warden. Barchester Towers is the first of Trollope's novels in which correspondences are casually referred to. Nevertheless, since these are few, brief and do not carry any of the novel's events, we may still count eighteen letters. Dr Thorne returns us to enumerable letters: there are thirteen. In The Three Clerks although Gertrude 'in continuation' to her family is an indeterminate correspondence, we can otherwise also count thirteen imaginary letters. There are in The Bertrams forty-nine individual letters, and epistolarity is no longer a matter of discrete units separable from the rest of the book: the narrator describes five different sets of correspondences, and he carefully characterises and paraphrases two more series of letters by two writers because they figure centrally in part of the novel's action. In The Bertrams we also find for the first time that curiosity which occurs repeatedly in Trollope's fiction after it: the letter a character attempts to write, meditates passages of, but fails to put on paper. Johnny Eames is one of Trollope's later characters who dreams his thoughts as letters he might write (The Small House 14; The Last Chronicle, 35). We can take some snapshots of piles of letters across the rest of Trollope's fiction. The Claverings, written in 1864, contains a staggering seventy-eight letters; two important series of correspondences, one aborted letter, and two more letters which are discussed, but put off and never written. He Knew He Was Right weighs in with more letters than any other. It has eighty-six individual compositions, one of which is burnt and another not sent after having been written, and one impotent attempt at a letter. There are eleven different series of correspondences, all of which are described, and all but one of which function centrally at some pivotal point in the novel or form a connective in the events of its stories. Is He Popenjoy?, a late book (1874-75), contains fifty letters, three ironic series, and three men who think about sending letters to their mistresses or wives who themselves compose long, poignant and compromising letters. After some consideration, the gentleman all decline to write. Finally, Dr Wortle's School, a very brief novella written four years before Trollope's death, contains for its size a prodigious thirty-one letters, four of which Dr Wortle wisely burns after writing. There is one letter planned but not actually put onto paper, a threat of a blackmailing letter, and one series of correspondence. It is to be noted that when a Trollope character experiences writer's block, it is usually temporary and he or she gets over it. I do not mean to imply that there is an immediate and steady increase in the number of letters per novel in Trollope's fiction from 1859 on. Castle Richmond returns us to sixteen letters and Framley Parsonage contains but twenty-five enumerable letters, and one indeterminate series. However, with their near companion in time, Orley Farm, Trollope seems to reach a plateau, a proportion of epistolary to omniscient narrative he is comfortable with: Orley Farm has thirty-six individual letters and two series of correspondences, one of which tells the story of two young lovers which we only learn about in these letters. Lady Anna, the last novel of Trollope's middle phase, has thirty-three letters, one of which is carefully written out but then torn to bits and never sent. Three are drafts of a letter written out for Lady Anna from the very different perspectives of the characters who compose them, none of which she sends because she won't agree to the decision contained in them all. There are also three series of correspondences. There are exceptions to Trollope's epistolary fecundity. Sir Harry Heathcote of Gangoil (1873) contains no letters at all. With some exceptions, there are few letters in Trollope's short stories and these letters are brief. The stories typically present characters who live in close proximity or whose culture does not encourage letter-writing — or, Trollopian thought, their Post Office is inadequate. The use of letters in the short stories resembles that of Linda Tressel and The Golden Lion of Granpère (both written in 1867). These are two brief mid-career novellas which depict people who live in cultures where writing is highly uncommon, and Trollope uses letters in them to dramatise crises and turning points in the books (Linda Tressel 7, 12-13, 16; Golden Lion 15-16). There are exceptions to every generalisation. One of Trollope's short stories, 'Josephine de Montmorenci' (1869) and for long stretches Kept in the Dark (1880) are in effect and throughout semi-epistolary novels with the interstices between letters filled by an ironic or unobtrusive narrator as the occasion may warrant (Kept in the Dark 4-5, 11-14, 16-20, 23). In The Landleaguers Rachel Mahoney's milieu is not one in which one might expect long letters, yet just about the whole of her story is literally told by her in letters, and when paper gives out, she resorts to tablets (8, 14, 34, 36-37). In The Prime Minister, the one thing the important characters in the political plot do not willingly do is write letters. In the Palliser plot of this late novel, the less you put on paper, the safer you are (42, 72). Two of Trollope's major novels and one short stories reveal characteristic uses of letters during Trollope's middle phase. In Can You Forgive Her? and The Eustace Diamonds Trollope uses antiphonal letters from places in the fiction which are literally far apart to debate a conflict. Such letters may be separated by the novel's imagined chronological time; it also often happens that just as a letter which demands a response is woven or dropped into the narrative, the narrator tells us he must leave off this story and resume another whose continued disappearance from our book might make us forget it for too long. In Can You Forgive Her? five correspondents, Kate, Alice and George Vavasour, their aunt, a widow, Mrs Arabella Greenow, and John Grey, Alice's suitor, provide a discontinuous epistolary novel inside the novel's larger terrain. These letters regale us with the adventures of the Widow Greenow at Yarmouth (14, 19, 69, 77), lure Alice into breaking off her engagement with John Grey, (12, 14), enable Kate to betray Alice by showing her letters to George, a cynical scoundrel (12, 32), and recount George's election ordeal (41, 46). The letters are themselves agents in the plot (15, 44, 46, 54, 57), reveal minds altering, trauma, cunning doubledealing and self-delusion (53). They show us why and how these characters come to make the choices they do (41, 60). These letters are not arranged in accordance with when they were written, but with when they will make the greatest impact on us. In this second phase of Trollope's epistolarity we find him using letters as a way of entering into the psychology of his characters and presenting them to us for the first time. In the third chapter of Can You Forgive Her? we meet John Grey through letters which reveal a studious and shy man's deeply-felt emotions (2-3, 10, 14, 36). Both the Widow Greenow and Lady Glencora, the central female character of the novel's Palliser plot, make their entrances upon Trollope's imagined stage well after its first instalment, rather like the heroines of Restoration comedy who first appear in the first scene of the second act. They are introduced through apparently gay letters (14, 18): we hear the Widow in the rebarbative and disillusioned approach of her letter to Kate, who has written asking for money for George (41); we are immediately attracted to Lady Glen because for her Trollope creates a child-like and affectionate yet perceptive and wry self-deprecating voice (18, 37, 62, 77, 79). The many sets of letters in The Eustace Diamonds begin after Trollope has slowly built up the several interlocking stories, and the reader is thoroughly absorbed in the fiction. By the opening of the fourth instalment of The Eustace Diamonds, Lizzie Greystock, Lady Eustace's adventures with lawyers, alienation from her relatives and friends, and engagement to Lord Fawn climax for the moment in a series of minimally polite business and false letters of friendship (5, 10). It is then that Trollope's second story begins, dramatically, with a letter dated midnight Saturday, when 'all among my books and papers' and battle-weary barrister, Frank Greystock, asks the penniless governess Lucy Morris to marry him (13). As Pearson puts it: 'typically, [Trollope] establishes a situation of conflict ... and then proceeds to introduce correspondence which dramatises, perhaps even more than conversation, the possibilities in or future direction of this conflict' (pp. 410-411; see also The Vicar of Bullhampton 15). The story of Frank and Lucy's protracted engagement is almost wholly carried on through letters. Its action is what happens in the minds of the characters as a result of reading their letters. This correspondence, woven across hundreds of pages (26, 33-34, 46, 59, 69) becomes painful to read when the abrasive Lady Linlithgow learns that Lucy is engaged to Frank. Fifteen chapters after Frank and Lucy's first meeting after their first exchange of letters, the narrator weaves into his narrative a redaction of parts of Lucy's otherwise withheld letter telling Frank how her employer, Lady Fawn's son, Lord Fawn has become very 'unpleasant', she 'is not to stay' and asking Frank 'what had I better do?' (30). A mixture of partly epistolary and omniscient narrative tells the story of how Frank's mother, Mrs Greystock, who does not want Frank to marry Lucy, writes a rich old woman, Lizzie Eustace's aunt, Lady Linlithgow, to ask if she needs a paid companion (30, 33). Frank himself finds it difficult to write to Lucy to tell her that she cannot stay with his mother; his letter includes the lie that the Greystocks are not inviting Lucy to live with them out of consideration for his father, the Dean. Frank's father has not been told because Lady Greystock knows her husband would be delighted to receive Lucy (30). Indignant and without feeling for anyone but herself, Lady Linlithgow writes Mrs Greystock a harsh insulting letter which draws attention to the venality of Mrs Greystock's manoeuvres. In this letter Lady Linlithgow decrees Lucy must leave in six months (35). She then tells Lucy that Lucy may not receive any letters from Frank while she lives with Lady Linlithgow (35). Lady Linlithgow later relents. She is not the only character in a Trollope novel first to forbid and then to allow letters. From Castle Richmond and Framley Parsonage on Trollope also repeatedly has one character read a second character's letter, and as a result write a letter to third character which communicates to the third character a decision based on the second character's letter. This decision causes the third character to write back to the first. Which leads to yet more and highly vexed correspondence. In The Eustace Diamonds Lady Fawn's letters to Lucy at first supplement and then replace Frank's increasingly short, evasive and infrequent letters. When Lucy refuses to believe Frank is unfaithful, Lady Linlithgow taunts her. A letter arrives from Lady Fawn which seems to confirm that Frank has abandoned her. In Lucy's anguish she tries to write Frank a letter to discover what has happened and give him the option of clearly terminating their engagement. Lucy's anguish makes writing a letter to Frank to discover what has happened very hard work. The happy ending to Lucy's story is partly the result of her decision to leave her letter lying within her desk (59, 76). In contrast, the triangle of Mrs Hittaway's letters to Lady Fawn and her sister, and Lord Fawn's letters to Lizzie, wherein he is driven by these family letters and threatening letters by Frank Greystock, The Eustace Diamonds 12, 14, 20, 30, 32, 56, 67-68, 73. In The Small House, The Last Chronicle and The Way We Live Now, we find various triangular love stories (Johnny Eames-Amelia Roper-John Cadell, Lily Dale-Johnny Eames-Madalina Desmoulins story, Sir Roger Carbury-Henrietta Carbury-Paul Montague-Henrietta Carbury, and Mrs Winifrid Hurtle-Paul Montague-Henrietta Carbury), all of which use triangles of this kind to dramatise complicated psychological treacheries. For earlier less intricate but similarly triangular patterns see Castle Richmond 14, 37; Framley Parsonage 4-5, 30, 35. The imagined letters and semi-epistolary narratives Trollope writes in the middle twelve-year phase of his career put before us inwardly-apprehended dramatisations of an extraordinary variety of human motives, moods and acts. In these years he seems often drawn to situations in which a friend or mentor writes a letter containing untrue information or harmful advice. He uses letters to reveal how bonds between people can make them pressure one another: in some cases, the imagined reader sees through the emotional manipulation but disregards it (Orley Farm 27, 36, 49-50, 66); in others, Trollope shows us how his writers do not realise how harassing or poisonous their letters are because they cannot imagine any tone of mind but their own (The Vicar of Bullhampton 54; Sir Harry Hotspur 22-23). In these years Trollope enjoys writing comical epistolary interludes with characters risking a defeat which will make them look humiliated and become an object of ridicule (e.g., 'The Turnover Correspondence' in The Vicar of Bullhampton 26, 35, 55-56). Trollope also will repeatedly put before us earnest attempts by his men to explain their life's goals to the women they consider themselves engaged to, together with the women's replies (Claverings 9; Rachel Ray 1863, 16; Ayala's Angel 1878, 34); more than one of his engaged females writes to a male character, acknowledging her love for him although she knows he is shallow and has betrayed her and could betray her again (The Duke's Children 1876, 77; Ayala's Angel 38, 59). I write to you for literary employment, and I implore you to provide me with it if it be within your power to do so. My capacity for such work is not small, and my acquirements are considerable. My need is very great, and my views in regard to remuneration are modest. I was educated at ---, and was afterwards a scholar of --- College, Cambridge. I left the university without a degree, in consequence of a quarrel with the college tutor. I was rusticated, and not allowed to return. After that I became for awhile a student for the Chancery Bar. I then lived for some years in Paris, and I understand and speak French as though it were my own language. For all purposes of literature I am equally conversant with German. I read Italian. I am, of course, familiar with Latin. In regard to Greek I will only say that I am less ignorant of it than nineteenth-twentieths of our national scholars. I am well read in modern and ancient history. I have especially studied political economy. For thirty shillings a week I will do any work you may impose upon me for the term of six months. I write this letter as a last effort to rescue myself from the filth of my present position, but I entertain no hope of any success. If you ask it I will come and see you; but do not send for me unless you mean to employ me, as I am ashamed of myself. I live at No 3, Cucumber Court, Gray's Inn Lane; — but if you write, address to the care of Mr Grimes, the Spotted Dog, Liquorpond Street. Now I have told you my whole life, and you may help me if you will. I do not expect an answer. Trollope's third phase begins three years after 'The Spotted Dog': from The Way We Live Now (1873) through to An Old Man's Love (1882), a river of only partly amused grief runs through Trollope's fictions. Lady Anna heralds and The Way We Live Now makes plain a change in the stance of Trollope's novels. Until The Way We Live Now in Trollope's fiction, except for rare instances of villainy, his narrator remains detached from the values of the characters while attempting to make us sympathise with them. With The Way We Live Now, Trollope's fiction turns satiric in outlook: a kind of steely self-distancing pervades the later books; Trollope's narrator no longer works to make us like the characters — though he may urge us to identify with them nonetheless. In Trollope's later novels letters are uncomfortable or unwanted events. All the letter-writers in these late novels seem ultimately to regard one another as opponents in a battle; the intelligent writers know they must hide a goodly portion of what they feel about any situation from the recipient of their letter. With lightning speed characters who were close friends or lovers can become wholly alienated from one another. The letter as prying nuisance, the letter written to start a public war, the letter as a peremptory challenge or direct threat, the letter written to entangle someone in a lawsuit or to strike someone down emotionally; badgering, spiteful, revengeful, and brutal letters occur frequently in or dominate The Way We Live Now, The Prime Minister, Is He Popenjoy?, Dr Wortle's School, Kept in the Dark and Mr Scarborough's Family. In The Way We Live Now we meet our first forged signature on a letter which was stolen from a drawer but has since disappeared (58). Of course nasty and brutal letters, together with craven replies, may be found in Trollope's mid-career books (e.g, The Eustace Diamonds 67, 73, 75; Phineas Redux 59). Anonymous and unsigned letters occur from the first novel to the last and they are always ugly in Trollope (Macdermots 25; Phineas Redux 68; Popenjoy? 18; Landleaguers 33). However, in the earlier phases of Trollope's career, letters are rarely sheerly weapons; characters do not so consistently regard their imagined reader as an opponent as well as a friend. Throughout Trollope's last books, his characters are allowed to see through the surface meaning of a letter to its manipulative content and act more or less unscrupulously on that. The three letters by Matilda, Lady Carbury with which The Way We Live Now begins are transparently corrupt (1); she does not bother to disguise her attempts to pressure her interlocutors. In Trollope's last books, his characters often write letters in order to maintain a hostile relationship. In Is He Popenjoy? the only reason most of the characters can pretend not to be full open enmity is they are physically apart (2, 6-7, 15, 20-21, 31, 36-37, 40, 46). Again I am talking about a general tendency or dominating trend. Things are not so bad in The Duke's Children (1876). While the Duke writes letters in order forever to cut himself off from other people (12, 51), other characters write letters in order to reconsider their alienation from, or humanely to inspirit one another (15, 22, 42, 50, 56, 60). In John Caldigate (written in the following year) alienated characters come together through writing because what irritated and got in the way of a friendship between two characters when they lived together does not seem so important as the relationship now that they are parted (13, 43, 45). Ayala's Angel (1878) contains many well-meaning letter-writers and recipients. It is worth noting though that except for the book's angel, the letter-writers of Ayala's Angel are also drawn somewhat exaggeratedly obtuse, selfish, stubborn and egocentric (7, 8, 9, 12, 14, 20-21, 34); their letters always irritate, harass or grieve someone (35- 36, 41-42, 69). The subject of the next long novel begun in the same year, Marion Fay — the death of a young Quaker woman from tuberculosis — occasions poignant letters in which Marion pours out the perplexities of a young woman under pressure to marry someone just as she lays dying (48, 55-56, 59, 62). Again, while Marion Fay contains letters which broadly parody types of aristocratic women, busy ambitious politicans and shameless boors, this novel also has a singularly mean-spirited anonymous letter which figures centrally in all its stories; two separate series of bullying and sycophantic, and blackmailing letters (in some of which murder is contemplated (11, 19, 26, 30-31, 46, 63). At the close of his career, Trollope also plays with letters and his memories of his life as a postal clerk mischievously. Everyone who has read John Caldigate remembers its ardent postal clerk, Samuel Bagwax, about whom Trollope as himself wrote to John Blackwood, 'Was I not once a Bagwax myself?' (Hall 2:815). Bagwax helps exonerate John Caldigate from a charge of bigamy when Bagwax discovers that the postmark on the envelope of an incriminating letter has been forged (30, 42 47). This is the letter as deus ex machina. Told in letters, the secret history of the mother of another postal clerk, George Roden, the secondary hero of Marion Fay, reveals that Roden is an Italian Duke in disguise; this overtly ludicrous discovery makes a parody of the book's one happy ending (44). Another postal clerk, Samuel Crocker, is almost fired for his 'abominable' and 'wicked' crimes: he postpones copying out, delays sending, and finally 'absolutely destroys' a bundle of bureaucratic letters (9, 31 47-48, 56-58). Trollope's later novels are not comfortable books; in them letters show us characters mangling one another or themselves out of their need for and fear of one another; see Tanner. In its use of letters The American Senator (1875) typifies his later years. The 'Rufford Correspondence' includes a series of letters written by Lord Rufford, the wealthiest and in the town of Dillsborough (or for him by his brother-in-law, Sir George Penwether) to Arabella Trefoil, a penniless aging niece to an Earl, who wants to marry Lord Rufford. This correspondence is interwoven with another between Arabella and John Morton, a diplomat, who while less wealthy than Rufford, actually wants to marry Arabella. First, the style of these letters is much broader and they are less detailed than the style of the letters of Trollope's earlier phases. The language is simpler, slightly coarse and, when compared to letters in his novels from Dr Thorne to Phineas Redux, generalised at the edges. From Lady Anna on, Trollope goes for archetypal words. In Trollope's last phase his characters often liken themselves to literary types. Even when comic or written by lovers who have had little contact with one another and speak into a vaccuum, the letters in, say, Dr Thorne have a specificity and detail (18, 52) lacking in, say, Ayala's Angel. The many more but shorter letters of Ayala's Angel (14, 18, 20, 35-36, 38, 42, 59) and The American Senator (34, 43) reveal broad allegorising tendencies and an impatience with individualising. About two weeks pass before Arabella receives Rufford's wary reply: he affects insouciance and writes that after all, he might not show at Mistletoe; if not, he will of course send Jack. This reply is 'quite terrible' to Arabella: such words to her are cruelly teasing. She lets down her guard a bit and writes that Rufford can have no idea what she have gone through to arrange to visit Mistletoe. She calls him unkind and ungentlemanly: 'Please, please come' (31). The narrator tells us that Rufford understands what is happening as well as Arabella when Rufford writes: 'Dear Miss Trefoil, — You shan't be disappointed, whether it be Jack or any less useful animal that you wish to see' (31). Trollope numbers these five letters for us because the next chapter reveals that just at the time that Arabella received Lord Rufford's first letter, she also received from John Morton a serious, long and somewhat affectionate letter. Morton asked Arabella if she 'is ready to declare herself his affianced wife before all the world'. We observe — as John Morton and Rufford cannot — the exact circumstances and criss-crossing letters which prompted Arabella to write each of her letters. While Arabella waits for Rufford's response to her plea, she doesn't reply to Morton's first. So Morton writes again 'severely, pressing her to reply', but when Rufford's wary jeer intervenes, she decides she had better not break her engagement to Morton so she writes a weaseling letter. Trollope's blend of free indirect speech, paraphrase, and quotation reminds us to read this letter from Morton's point of view as well as our own (32). But she 'collects her courage' and makes that last entreating plea to Rufford which is momentarily successful. This series of letters continues with the encounter between Rufford and Arabella at Mistletoe (The American Senator 36-40) which leads to the book's climactic dramatic scene (67); letters between Rufford or his much more intelligent brother-in-law, Sir George Penwether (who dictates Rufford's letters) and Arabella in which the woman continues to attempt to ensnare the man and the man to elude her (44-45, 48-49, 61-62, 66); and John Morton's letters, which however honourable, read dully and are the letters of a man duped by his incapacity to understand the minds of others or his own (50). Trollope twice uses epistolary rearrangement to climax these two chapters on Arabella's switch from Morton to Rufford in order to place before us how much this woman's stubborn resistance against accepting a lower and less exciting place in her society costs her, how much mortification and punishment she is willing to take. Since Trollope tells this story through inserted letters, interwoven redactions of letters, and acts of reading and writing we experience how easy it is to be duped by others because nothing can begin to capture all that happens in human minds which leaves no discernible trace. 'I shall be delighted to save the life of so good a man on such easy terms' ... Then and there, with a pencil, on the back of an old letter, he wrote a line to Larry asking him to shoot on next Saturday, and dine with him afterwards at the Bush' . It is enough for a Lord Rufford casually to scrawl his invitation in pencil as a line on the back of an old letter to give a Larry Twentyman 'true delight' (48). I began this talk by asking what does Trollope do that his contemporaries don't do. My answer has been that he makes a perceptive use of all a letter's characteristics as these are experienced in society. He is also innovative in his skillful compression of free indirect speech, redactions of letters, and acts of reading and writing within a omniscient narrative made subjective by an active story-teller's consciousness. I think it significant that Trollope never makes the mistake many fiction-writers have made ever since people first began to write long prose stories and divide these up into parts. He never uses the label letter for chapters of stories written in the first-person. Trollope calls letters only those texts which are written with imagined readers in mind — and to the moment. The continuous psychological suspense of his books partly derives from his understanding of what a letter represents. 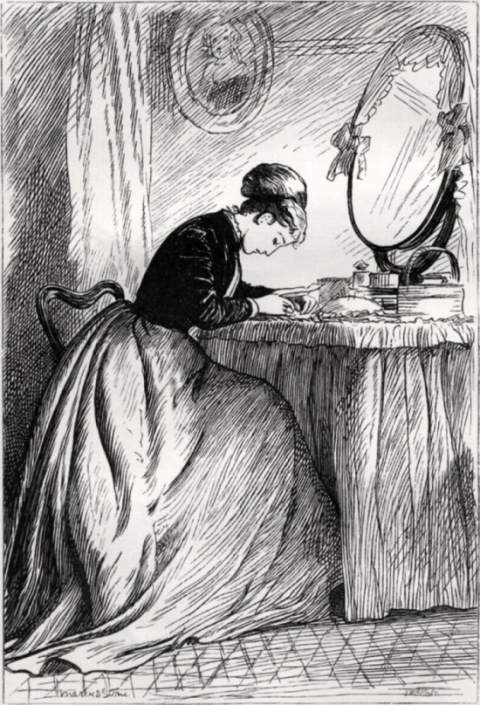 In the book I wrote for this society I had an unexpected experience: I discovered that Trollope's illustrators repeatedly depict his characters hunched over their desks writing or bent over their letters reading them. Pearson, David. '"The Letter Killeth": Epistolary Purposes and Techniques in Sir Harry Hotspur of Humblethwaite', Nineteenth-Century Fiction, 37 (1982), pp. 396-418. Tanner, Tony. 'Trollope's The Way We Live Now: Its Modern Significance', The Critical Quarterly 9 (1967), 256-71.